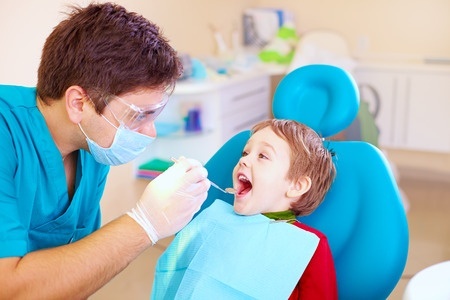 Whether your child is mildly nervous or seriously afraid, try these strategies to make visiting the dentist in Fresno CA a more positive experience. Start early. The AAPD recommends scheduling your child’s first visit as soon as teeth begin to appear or by his first birthday. The benefits of early and regular dental care are two-fold: Your child gets into the routine of seeing the dentist while he’s still young (and possibly less nervous) and staying on top of any potential problems can cut his chances of needing extensive (ouch!) dental treatment down the line. Get a little bit closer. Having a parent’s hand to hold or lap to sit on while getting their teeth checked out can be a big comfort for kids. But don’t do too much talking. Yes, it’s tempting to maintain a steady stream of chatter in hopes of distracting your child from the exam, but resist. Letting the dentist do the talking will help him develop a better rapport with your child, say the experts at the American Academy of Pediatric Dentistry. Have questions? Speak to your dentist in Fresno CA after he completes the exam. Take it slow with kids prone to gagging. Children often have a fear that they’re going to gag and choke but it’s usually more of a psychological problem than a physical issue. When a dentist goes slowly, is patient, and provides positive encouragement as a child gets used to having her teeth cleaned and examined, it lets her gradually understand that there is no real cause for concern. For kids who are sensitive to gagging, x-rays can be hard because the small film tabs have to be inserted pretty far back in the mouth. Make the most of distraction. Many dentists’ offices have TV screens playing kid-friendly shows or videos mounted near the exam chair to attract kids’ attention. Another option: Ask your child’s dentist if she can use your smartphone or MP3 player. Popping in the earbuds and listening to favorite tunes or a book on tape can help take the focus off the dental procedure. Run interference if siblings or friends tell scary dentist stories. Is the kid next door detailing the time his dentist yanked on his tooth so hard people could hear him scream from blocks away? Put the kibosh on those types of tales as quickly as possible. Don’t say, ‘Don’t worry. It won’t hurt. '” Of course you mean to reassure your child but his mind is going to zero in on the word hurt. Checkups and 90 percent of first visits are nearly always pain-free, so steer clear of that concept entirely, recommends the AAPD.